The Reverend Christopher J. Patterson was born in Milwaukee, Wisconsin, 1969 and graduated Martin Luther High School, Greendale, WI, 1988. He entered the Director of Christian Outreach (DCO) program at Concordia College, St. Paul, MN, interned at First Lutheran Church, Windsor, Ontario, and graduated St. Paul in 1994. He returned to First Lutheran as their full time DCO and served there until 1999. Chris accepted a call to serve as DCO to Christ Lutheran Church, Bowling Green, Ohio, in early 1999. Chris left Christ Lutheran in 2001 to begin his studies for full time parish ministry at Concordia Theological Seminary, Fort Wayne, IN. Chris served his vicarage at St. Luke’s Lutheran Church, Oviedo, FL, then returned to Fort Wayne for graduation in 2005. 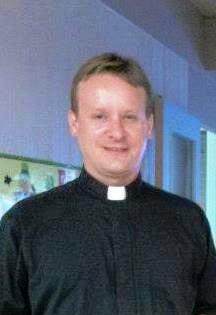 He was assigned a call to Greenwood Lutheran Church, Greenwood, SC, where he was ordained and installed in 2005. He served Greenwood until accepting the call to Concordia in 2008. Pastor Patterson met Judy Frampton while attending Concordia, St. Paul. In April 1994, Chris and Judy were married at her home church in Fort Pierce, Florida. They are the proud parents of three boys: Aaron (2000), David (2001) and Samuel (2003).